"He was so happy and eager to show us these two waterfalls. 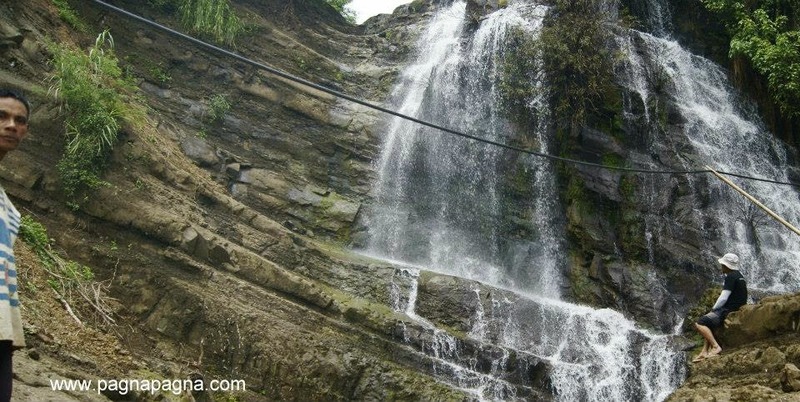 I personally call them collectively as Manding's waterfalls"
Continued from the blog post "KIBKIBULAN Falls"
From Kibkibulan falls area (10:10 am), we walked along the main cemented road (going towards City proper) and went to a sari-sari store to have a merienda (snack). We asked the store owner where can we find the other waterfalls. 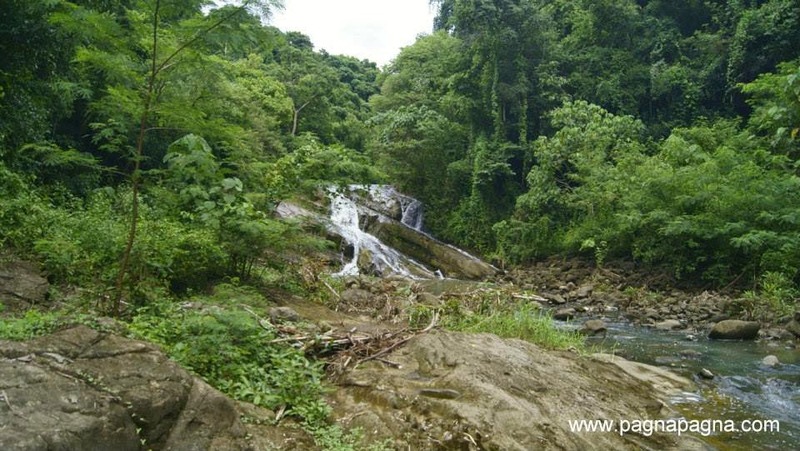 The store owner said that it is Duplas falls which can be found after the Welcome arch (Pao Sur) and ask directions when we get there. We continued walking along the main road (10:38 am). It really became hotter as we walked along the road. We arrived at the Welcome arch of Pao Sur (11:00 am) and there we had known that we should still go further down the road where there will be another store. At the store, we went to the other side of the road and walked on an intersecting dirt road. At the end of the road was a lone house where one of the resident showed us the connecting trail going down to the mountainside and into the creek below. We removed our shoes. I put on my slippers to walk on the waters of the creek. As we got nearer the waterfalls, I saw a man standing at the left side of the pool area of the Duplas waterfalls. He was alone. He saw me, I smiled and I noticed that his mouth was somewhat twists to one side, his eyes from time to time opened widely as if to stare and one of his hands seems to also twist to the back. I turned my eyes away from him, he might not want me looking at him. I said "Nagmayat nya" (It looks good) pertaining to the waterfalls. "Wen mayat ada pay nangatngatu dita nay" (Yes it looks good, there is a higher one over there) he answered with an accent or intonation that goes up (an accent of the countryside). It also sounded as if he was shouting at the end of his sentences and as if he had a hard time blurting out the words (a little bit inaudible sometimes). "Intayun kitaen" (Let's go see) he said to us eagerly as if he had known as for a long time. "Aguray ta ag-picture ak lang" (Wait, I'll just take some photograph first) I said to him. He waited for us patiently while we took photos. We came to know that his name was "Manding". After which he led the way at the mountain side into the upper waterfalls. There it was the Dissu-or Falls. The Dissu-or Falls. Can you see "Manding" in the picture? "Apay ngay nakasakasaka ka, ayan na diyay tsinelas mu?" (Why are you barefooted, where are your slippers?) I asked him. "Inbatik dyay balay" (I left it at home) he replied. "Anya ngay pay ti adda dita ngatu ti sangbay?" (What is on the top of the waterfalls?) I asked him. "Intayu kitaen, maykayu ditanay lang pagnaan" (Let's go see, come, that is the way) he answered back. "Balay ni antik dayta" (That is the house of my aunt) he said as we passed by a residential area with only few houses. We finally arrived on top of the waterfalls but nothing much to see, we went back to the trail (12:48 pm). Along the trail, we decided to put back our shoes on. Looking at my slippers, I said to him "Bagi mun datoy tsinelas ney, mayka ni alaem mon" (This slippers are yours, come and get it). Without hesitation, he came to where i was and put on the slippers and we continued our walk going back up. We arrived at the lone house (We learned that "Manding" also resides there). Her brother came out and greeted us. We thanked them and we went on our way back to the road (1:00 pm) leaving Manding behind. We walked some few meters along the main road until we arrived at a waiting shed (1:15 pm) where we rested and waited for a passenger jeep. At the waiting shed where we waited for a jeep. The man on my left was also waiting for the passenger jeep. He went there to get some firewood. The lone jeep for that afternoon came (1:20 pm), we rode on it until we went down at city proper and eventually went to Home Sweet Home. From Manila take a bus bound to any of these: Laoag, Vigan, Candon, Abra and San Fernando,La Union. Get down at San Fernando City, La Union City Plaza. At the plaza hire a tricycle that will bring you up to Barangay Pao Norte and ask directions at the barangay Hall.